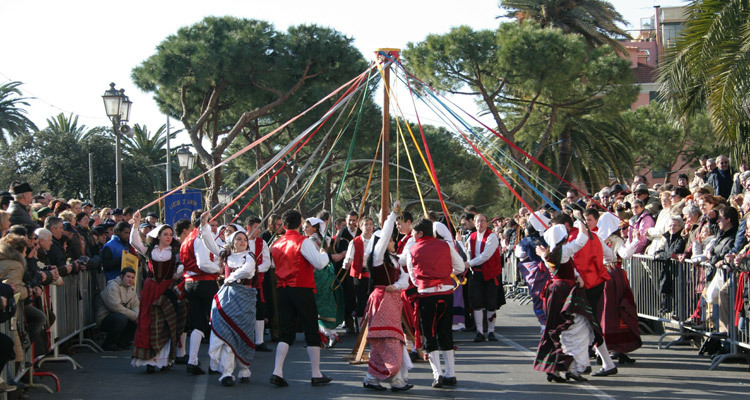 In few regions as in Abruzzo the folklore is still today an true note of local custom. The Abruzzo boasts a patrimony of magic and religious rites, of pagan and christian feasts, of saints to revere and of evil powers to be exorcided. In Cocullo (L’Aquila), in honour of St. Domenico, it’s celebrated, the first thursday of May, the feast of the Serparis: the statue of the Saint unthreads in procession covered by alive snakes followed by thousand of believers. Many suburbs of Abruzzo preserve the habit to burn on the Christmas fire, little dishes that compose the menu, with the goal to let Jesus take part to the Christmas’ dinner. The most famous Christmas event of Abruzzo, develops in January: it’s the living Manger of Rivisondoli, played by inhabitants, which every year fight to have a role as a first charachter of Nativity.